One of my friends works in a healthcare analytics company. He often connects with me on some of the real-life issues he faces while working with data in Excel. 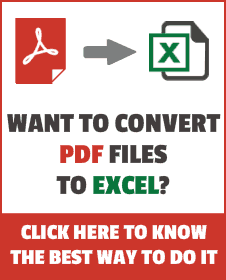 A lot of times, I convert his queries into Excel tutorials on this site, as it could be helpful for my other readers as well. This is also one such tutorial. There is address data in a column in Excel, and I want to identify/filter cells the where the address has duplicate text strings (words) in it. Now what makes this difficult is that there is no consistency in this data. Since this is a compilation of data set that has been manually created by sales reps, there can be variations in the dataset. Any text string could repeat in this dataset. For example, it could be the name of the area or the name of the city or both. The words are separated by a space character, and there is no consistency in whether the city name would be there after six words or eight words. There are thousands of records like this, and the need is to filter those records where there are any duplicate text strings. After considering many options (such as text to columns and formulas), I finally decided to use VBA to get this done. This custom function analyzes each word in the text string and checks how many times it occurs in the text. If the count is more than 1, it returns TRUE; else it returns FALSE. Also, it has been created to only count words more than three characters. Once I have the TRUE/FALSE data, I can easily filter all the records that are TRUE. Now let me show you how to do this in Excel. This is done by creating a custom function in VBA. This function can then be used as any other worksheet function in Excel. Thanks Walter for suggesting a better approach to this code! 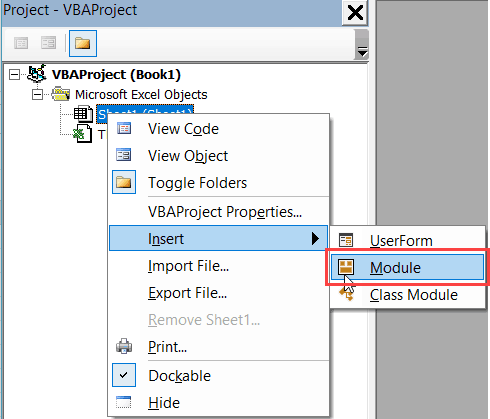 Now that you have the VBA code, you need to place it in the backend of Excel, so that it can work as a regular worksheet function. In the VB Editor back end that opens, right-click on any of the workbook objects. Go to ‘Insert’ and click on ‘Module’. This will insert the module object for the workbook. Once you have the VBA code in the back end, you can use the function – ‘IdDuplicates’ as any other regular worksheet function. This function takes one single argument, which is the cell reference of the cell where you have the text. The result of the function is TRUE (if there are duplicate words in it) or FALSE (if there are no duplicates). Once you have this list of TRUE/FALSE, you can filter the ones with TRUE to get all the cells that have duplicate text strings in it. Note: I have created the code only to consider those words that are more than three characters long. This ensures that if there are 1, 2, or 3 character-long words (such as 12 A, K G M, or L D A) in the text string, these are ignored while counting the duplicates. If you want, you can easily change this in the code. This function will only be available in the workbook where you have copied the code in the module. In case you want this to be available in other workbooks as well, you need to copy and paste this code in those workbooks. Alternatively, you can also create an add-in (enabling which would make this function available in all the workbooks on your system). Also, remember to save this workbook in .xlsm extension (since it has a macro code in it). Excel Advanced Filter – A Complete Guide with Examples. Dynamic Excel Filter Search Box – Extract Data as you Type. Can I get VBA learning from the very basics? Hey Aniruddha.. You can get some tutorials here. I am currently working on creating basic step-by-step tutorials on VBA. Will start posting in the next 2 weeks. You can subscribe to my email list to get notified. Really useful. Thank you very much….!!! really nice code and it does a great job. It would help us a lot if you would go a little more into detail of what the various parts of the code do – e.g. (modrng = WorksheetFunction.Substitute(rng.Value, ” “, “@”, numberofspaces + 1 – i) – so some value = some other value(some value, space, ? @?, #spaces+1-count) ??? Nice you all tutorial thanks of help . Glad you’re finding the tutorials useful! Yes, But can you share more tutorial about SQL and Pl/SQL topics. Hey Mithilesh.. I only create tutorials on MS Excel. 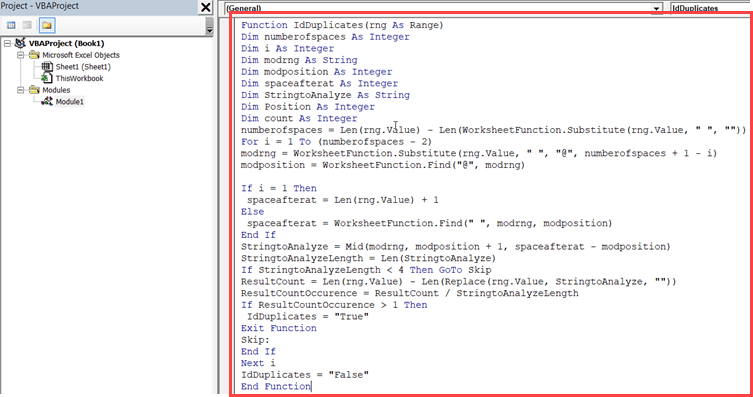 This takes advantage of the Split function in vba. It could be streamlined more. Do While i <= UBound(StringtoAnalyze) And IdDuplicates2 = "False"
If StringtoAnalyze(i – 1) = StringtoAnalyze(i) Then IdDuplicates2 = "True"
Thanks for sharing Ben.. I agree, Split and Lbound/Ubound could be a cleaner approach. I tried your code but it didn’t work. returns TRUE in all cases. Also, the one I have considers that any words (at any position could repeat). So it the same word could be at 2nd and 5th position, and it will be highlighted. Also made a change to identify words even if in different cases. If Len(StringtoAnalyze(i)) < minWordLen Then GoTo SkipA For j = 0 To i - 1 If StringtoAnalyze(j) = StringtoAnalyze(i) Then IdDuplicates = "TRUE" GoTo SkipB End If Next j SkipA: Next i IdDuplicates = "FALSE" SkipB: End FunctionWill update on the site soon.